No matter how durable, protective, and insulating the new product is, any home improvement can only be as good as its installation. That’s why we only use trusted crews that we have had years of experience working with. Our friendly and professional installation crews meet all manufacturer and state compliance standards, and all UNICORP siding projects are fully covered by manufacturer warranties. From start to finish, we take great care to make sure that your home and property are undisturbed by the installation. The best you can get doesn’t stop with the product, so we make sure you receive the best installation to go along with it. The installation is complete! Our field supervisor then does a final walk-through to ensure quality. Kingspan GreenGuard RainDrop 3D Building Wrap’s innovative drainage channels keep water out of the wall system. The channels are designed not to crimp, collapse, or flatten, ensuring water will drain no matter how tightly cladding is nailed to the wall. RainDrop is a recognized air barrier material listed with airbarrier.org, and it has demonstrated water holdout capabilities in industry-recognized water resistance tests. This non-perforated wrap also breathes to allow moisture vapor to escape. All of our siding crews are fully accredited by our siding suppliers to install their siding. This means that you will never have to worry about a faulty installation voiding your siding warranty, and exposing your home to the elements. 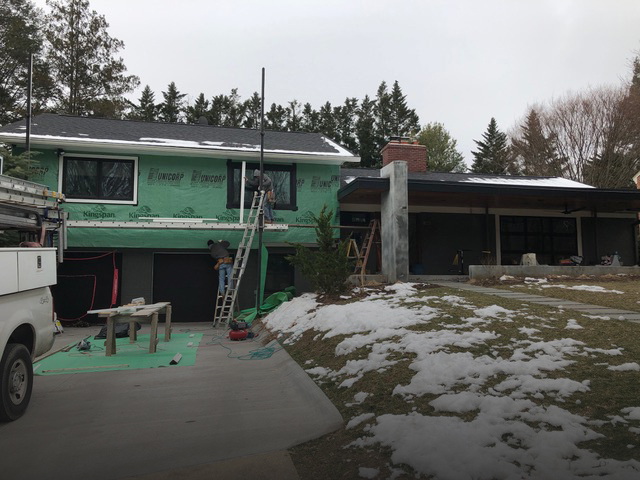 Our crews are trained to follow James Hardie Best Practices for James Hardie Siding and Trim products, and we are also completely OSHA compliant on job sites.